Riverside, Iowa – The 2019 Iowa PGA Season Long Match Play will begin in the month of April following the completion of the East and West brackets. The first round of matches will be completed by the end of April and the event will end in September. 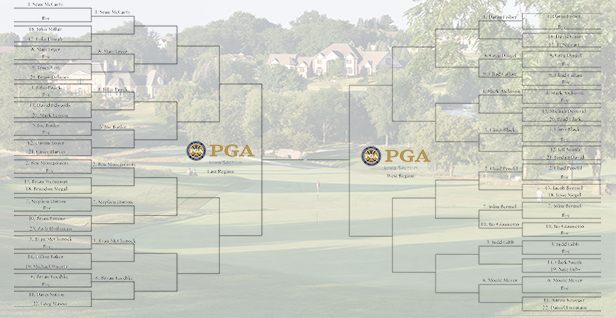 Champion of the West Region to determine the 2019 Iowa PGA Match Play Champion. Darin Fisher of the Preserve on Rathbun Lake received the No. 1 seed in the West Region after winning the Championship in 2018. Fisher defeated Chris Black in the 2018 Match Play Championship Match 3&2 at Blue Top Ridge last September. Fisher has received a bye into the second round where he will face the winner of David Gantt vs. Ty Stewart. Fisher was the runner-up for the 2018 Iowa PGA Player of the Year and won the 2018 Iowa PGA Low-Scoring Average Award. He also won the 2018 Iowa PGA Professional Championship at Glen Oaks Country Club for the second time in his career. Sean McCarty of Brown Deer Golf Club garnered the No.1 seed in the East Bracket. McCarty was named the Iowa PGA Player of the Year for the 10th time in his career in 2018 and was the runner-up to Fisher at the 2018 Iowa PGA Professional Championship. The top-10 seeded players in the West Division have received byes into round two, while the top-8 seeded players in the East Division received first round byes (based on number of players in each region). There is a total of six rounds in the Season Long Match Play. The first five rounds will consist of matches between players in their respective Regions. The sixth and final match is the Championship Match between the Region Champions. Click here for full brackets.